The scenics between Congress and Kirkland were amazing, but there’s no place to not pay attention to the road, let alone stop for a photo. So, you get I-40 heading toward Williams instead. 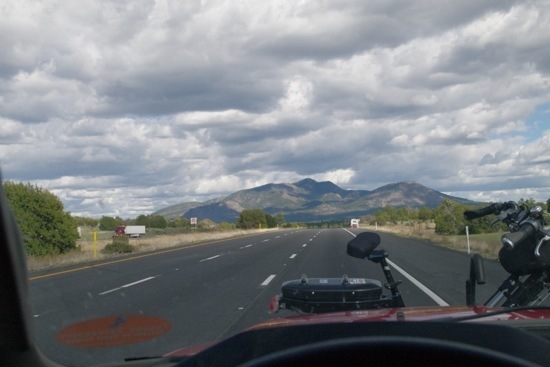 I arrived in the Prescott National Forest a few miles north of Paulden, Arizona today. It was supposed to be yesterday, but my departure was held up by the discovery that the 2-year-old connector hoses running from the dual 30# propane tanks to the pressure regulator on the front of the Defiant were leaking. I was going to take a date-expired tank in to a welding shop in Wickenburg that also does propane refills. They swap them for newer ones for $9.50. Opening up the remaining tank on the trailer showed it to be empty, which it definitely should not have been. Both rubber hoses showed deep cracks, so that was that. It took me long enough to find an accessible dump station, trade in the propane tank for a 5-year newer one and chase down two hoses, that it would have been a bugger to get to Paulden so late in the day. The Defiant Biosphere heads into the forest in Tusayan. already occupied, and looked around some. East of route 89 has mice galore anyway, so I crossed to the west and found a primo spot. Level, allowed me the orientation I need, and partially secluded from the miserable trail in. I got out and looked around, and my joy faded as I loafed, looking at things. There were flying bugs all over, just like Wickenburg had become, and although it was just 82, it felt almost hot. I quickly found that was tired of staying at just below sweaty departure temperatures, and looked up weather forecasts for the next week. Survivable, in the low to mid-80s. Given the direct sun magnifying that, I looked up Tusayan, which is just south of the Grand Canyon at a higher elevation than Paulden. Hmmm, low 70s, but daily drops of 40 degrees at night, which put me at freezing or just above at night. I decided to be uncomfortable in the other direction for once. Given a choice, I think I prefer to dress warm in cool temperatures, rather than strip, sweat, and turn on fans. I can go out walking and not overheat, and dress slightly better than a wet T-shirt, shorts, and sandals. The poorly-insulated Defiant’s cabin temps typically bottom out just 10 degrees above ambient, so I may regret that executive decision, but it was a decision that had to be made. That’s why they pay me the big bucks. 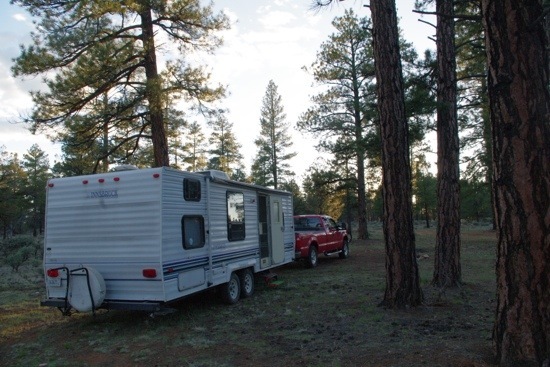 My spot in Tusayan on NF 302 was occupied by an even older duffer in a fifth-wheel who had a campfire going at 5 in the afternoon, and it was about 73 degrees out. Okaaay. 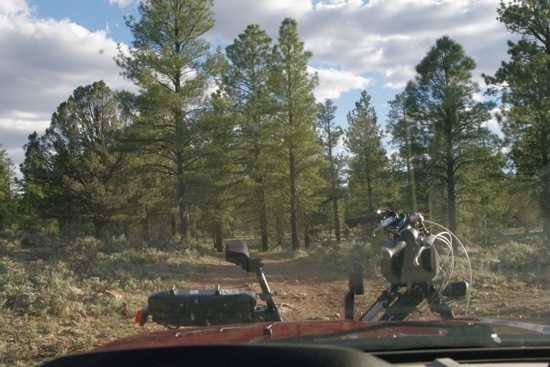 I broke out the Avenza Motor Vehicle Usage Maps for the Kaibab Tusayan area on the ancient iPad, and headed west into unfamiliar territory. It was well after 5 PM by this time, and I took a trail to Tusayan’s power station and parked on the gravel. I broke out the Evelo e-bike from the front of the Mighty Furd, since the trails were rough and closed in, which is not the best thing to drag the trailer into without some foreknowledge. Though not all that far from the highway, this is fairly close to primordial forest in general feeling. I didn’t go all that far along a few trail branches. Two looked hopeless for the Defiant, and one looked pretty good, as long as the weather doesn’t turn wet. I located a spot which is at the intersection of two trails, so it’s not secluded but will do fine if nothing else can be located tomorrow on the bike. I’m staying in Transport Mode (no solar panels) for now, until I can either locate a better spot or fail miserably and stay put to deploy them. Found a spot not far in! I could have ridden a little further, but you get an impression about trails as you head down each one. This is such an impressive forested wilderness area that this suburban boy was eventually creeped out while biking along over the submerged rocks. It is soooo quiet. The thought occurs, “Despite the many elk here, I’m not aware of a single sighting of a bear here (unlike Paulden), but this is certainly excellent territory for one.” Then I wish I at least had my bear spray. Who knows what could come out of all that surrounding cover? Oh well, that oversight will be corrected when I head out tomorrow to put on some miles further west. People occasionally drive by, so other campsites do exist. The only question is maneuvering room. Proof that I can once again charge my iPad, iPhone, etc. Lest I forget, the sole 12V coach battery outlet in the trailer quit yesterday evening. It’s one of those Wineguard combo jobs that serves as both an outlet and a TV cable hookup. I figured it was a fuse, but no. I was fortunate enough to find one in stock on the way out of Wickenburg, and installed it before sunset. 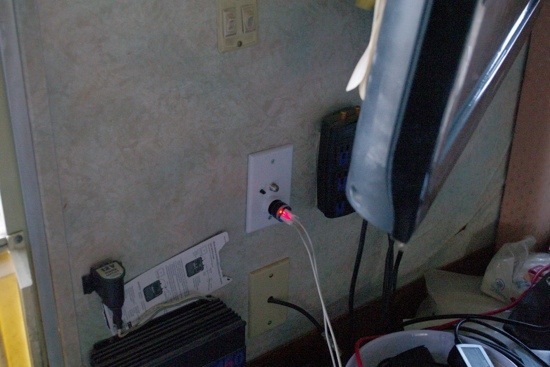 I use that outlet for recharging things and for running the CPAP, and it actually becomes important in Travel Mode, when the office pack is a last resort for power due to the lack of solar. We’ll test out that “I’d rather be cold” theory tonight. I’m with you on the ‘it’s easier to add layers than to strip off skin’ temperatures. Thank you, Linda! Yep, today peaked in the mid-70s and the lows at night have been like 38, which is less of a spread than predicted. I’m likin’ it! The service facilities are marginal here, but if it’s beauty and comfort you’re after, this is the place to be right now!